With only four rounds left in the 2018 Lucas Oil Pro Motocross Championship, the points battle in the 450 Class is about to hit the stretch run. Only seven points separate Eli Tomac and Marvin Musquin this week as the riders head to the Pacific Northwest for the Motosport.com Washougal National. Whether you prefer to watch online or through your television, here's a rundown on how to see all the action. UPDATE: A 30-minute intermission has been added in between the first and second motos. Second motos will now start 30 minutes later, at 6:30 p.m. ET (3:30 p.m. local time). Exclusive to NBC Sports Gold will be live coverage of qualifiers — specifically, the second practice sessions for the 450 A and 250 A groups — at each round. For American fans, television coverage of all 12 rounds can be found on MAVTV and the networks of NBC. As always, MAVTV will show the first motos in each class live. For this week's race, NBCSN will air the second motos later that night. 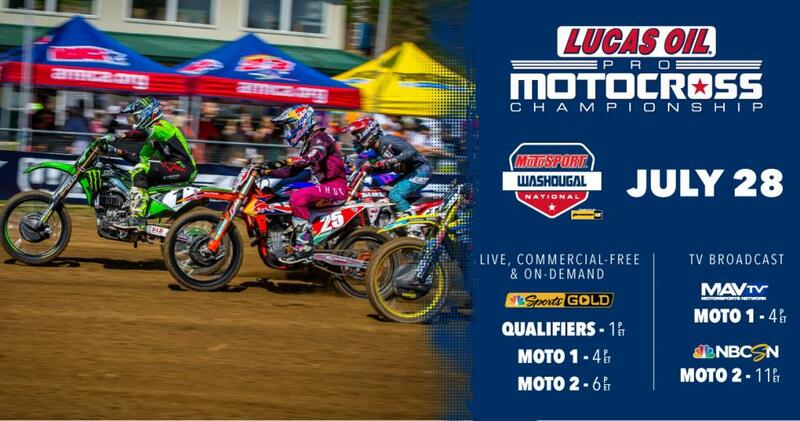 The U.S. television schedule for Washougal is below. For fans outside the U.S. who don't have access to NBC Sports Gold, the Nationals will be simulcast to various countries across the globe. Check your local TV listings for the time and network in your area.